Home » Movies » Happy Birthday Guillermo del Toro! Happy Birthday Guillermo del Toro! Written by: JediJondee46 on October 9, 2018. Happy Birthday Guillermo del Toro! His first film was Cronos (1993) which was a horror movie involving a device to keep owners immortal. It co-starred his long time co-star Ron Perlman. He moved from there to The Devil’s Backbone (2001) which began his collaboration with cinematographer Guillermo Navarro and composer Javier Navarette. Guillermo entered the studio system with the horror movie Mimic (1997) which was a brilliant film about a CDC doctor who uncovers a strange breed of insect underneath New York. Next, he directed Blade II (2002), a masterful entry in the vampire action franchise. Guillermo then directed Hellboy (2004) based on the Mike Mignola comic book. It featured Ron Perlman as the demonic anti-hero. One of his best films is El laborinto del fauno or Pan’s Labyrinth (2006) as it is better known. A dark fantasy that blends Alice in Wonderland, fairy tales, and the harsh reality of the Spanish Civil War. It won the Academy Awards for Best Art Direction, Cinematography, and Make-up. He followed it up with Hellboy II: The Golden Army (2008). In 2008 he formed the production company Cha Cha Films with fellow filmmakers, Alfonso Cuaron and Alejandro Gonzalez Inarritu. 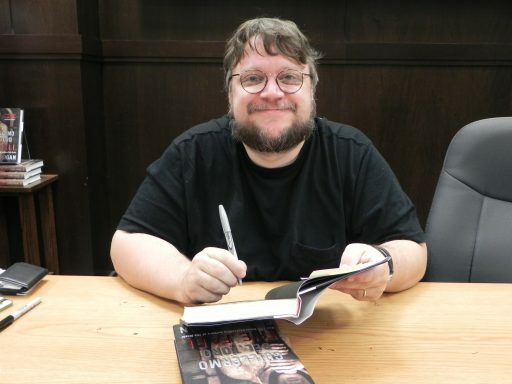 Guillermo del Toro at Barnes & Noble book signing, 2010, photo by the author. Guillermo worked on a television series and later turned into a trilogy of books starting with The Strain (2009) with co-author Chuck Hogan. In 2013, he directed Pacific Rim (2013) merging his love of kaiju and mecha. Guillermo co-directed with Hideo Kojima the video game P.T., in the Silent Hill franchise, for PlayStation 4. He directed the pilot, “Night Zero” (2014) of the series The Strain when the series arrived for FX. Afterwards, he directed the Gothic horror movie Crimson Peak (2015). Guillermo abandoned plans for an animated series and instead Trollhunters was made into a book in 2015 with co-author Daniel Kraus. The animated series Trollhunters: Tales of Arcadia with Dreamworks Animation was finally realized in 2016 and continues today for Netflix. In 2017, Guillermo opened his house, so to speak with the touring exhibition Guillermo del Toro: At Home with Monsters. He finished the year with The Shape of Water which won him the Academy Award for Best Director and Best Picture. Happy Birthday Guillermo del Toro!